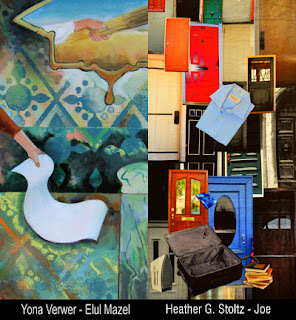 The Tribeca Synagogue for the Arts presents 2 exhibitions by Heather G. Stoltz and Yona Verwer. 49 White Street, New York, NY 10013. Opening Reception: Thursday, October 17, 6-7PM. Jewish Week article by Caroline Lagnado here. 3 Blocks below Canal Street, between Church St & Broadway. See map here. Both artists work with Jewish themes: Biblical Women, Divine Text Messages and Jewish Zodiac paintings. The artists also address New York's vulnerable as a common theme: Verwer counters the vulnerability of various New York sites, while Stoltz looks at the homeless population. 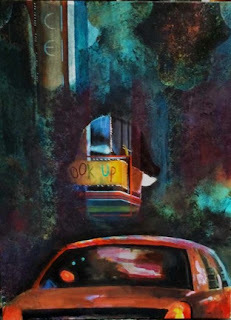 Stoltz's social justice art encourages the viewer to consider the story of one homeless individual at a time. Her quilts transform the stories of New Yorkers in Faith-Based Shelters. This project started in 2008 when she became a Community Service Coordinator for the Stephen Wise Synagogue. Spending time at their shelter, and later at those of Bnai Jeshurun and the Church of the Holy Trinity, she interviewed many shelter guests. Her work "Steven" is based on a 42 year old man who just finished a 12 step program for drug addiction. Verwer's series "City Charms", started after 9/11, invokes divine protection from acts of destruction on New York buildings, particularly terror-watch-list targets. Inspired by the Kabbalists who used amulets for intervening in the natural course of events, her apotropaic images aim to invoke protection against attacks and to bring good luck. One day she hopes to project these amulet images on their corresponding buildings. A spin-off series, "Temple Talismans", features amongst others "Times Square Taxi: God's Medallion" and "Stanton Shul Amulet". the latter's Statue of Liberty image is an homage to the immigrants who built that community. Verwer, an immigrant from the Netherlands, views the statue as a symbol for the religious freedom; she is intrigued by this symbol of a powerful female protector, adorned with the work by a Jewish poet, Emma Lazarus. Her Mazalot images are inspired by Lower East Side Jewish zodiac murals. The original 20th century folk murals in the Bialystoker Synagogue and the Stanton Street Shul are rare: only 1 other working synagogue features zodiac murals. 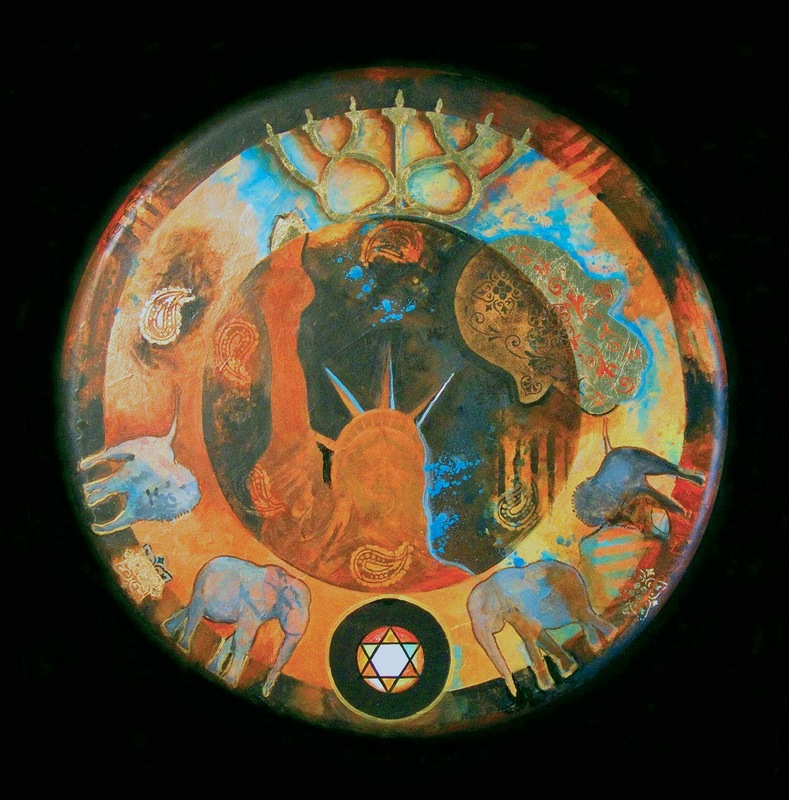 Verwer, along with other artists, was commissioned by the Stanton Street community to paint a contemporary interpretation of their murals; she chose the Elul mural as inspiration. The exhibit also features 2 paintings based on the Bialystoker Sivan and Elul panels, as well as Stanton Street's Adar and Elul. 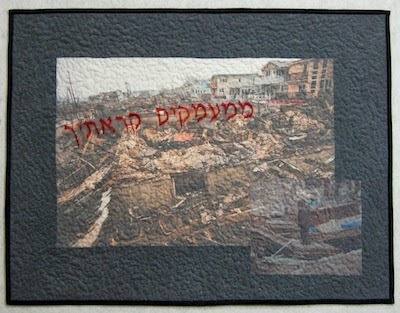 Another aspect of both artists' work is informed by traditional Jewish texts and liturgy. Stoltz’s quilted wall hangings and fabric sculptures feature Biblical women, giving voice to these often overlooked characters and Jewish liturgy, capturing the spirit of prayers that can be lost in daily repetition. Her Women of Valor is a representation of Midrash Eishet Hayil, which matches one Biblical woman to each verse of Proverbs 31:10-31. Each of the twenty-two blocks of the quilt depicts one of these women, using different colors and symbols to represent their characteristics and actions. The border represents Beruriah, who is described as the woman of valor in Midrash Mishle. Verwer's paintings Urim & Tumim - Divine Text Messages refer to gemstones engraved with the names of the Twelve Tribes of Israel and consulted by the Jewish high priest in moments of crisis, when the inscribed letters would be illuminated and rearranged to reveal divine guidance. Viewing Hours: October 17 - December 15, 2013 by appointment: 212-966-7141. Dutch-born Yona Verwer is a New York-based artist, curator and the co-founder / president of the Jewish Art Salon, a global group of artists, curators and critics. Her works explore identity, tikkun olam, and kabbalah. Her installation "Tightrope", at the Y.U. Museum's current exhibit "It's A Thin Line", has been featured in Hadassah Magazine, The Jewish Week and The Jewish Press. Verwer has shown in numerous venues including the Philadelphia Museum of Jewish Art, the Mizel Museum, the Reginald Lewis Museum for African-American Art, and the Holocaust Memorial Center. She has been featured in the New York Times, the New Yorker and the NY Daily News. Her work can be viewed at yonaverwer.com.